Weaning can be the most stressful period of owning a horse. The pair is playing and grazing together happily and yet you know you are going to have to separate them. When you do separate them you don’t know what’s going to happen. Your foal may become sick and you will become concerned for their well being. The range from four to six months of age is the recommended weaning age. A veterinarian will advise you on the best age to wean a horse. The hardest thought for weaning is that the horse may miss their mother. Many have said that weaning around the dark of the moon is the best way. Although whether or not this way of weaning really works it is difficult to say. The abrupt method is the most common method of weaning. This is when you simply cold-turkey and separate the two horses. The foal is then placed in with a few other youngsters in a similar situation. You may want to decide to take your mare away, perhaps even back to the boarding stable where they were before their foaled. You can pasture the mare full time with several other mares since the familiarity of the situation may be helpful. Some mares can be loaded easily. They may fuss in the trailer for a few minutes, but they will often be fine once they are turned out with their old pasture mates. Meanwhile you should place the foal in with at least three other foals. The foal may run around for awhile and pay not attention to the other horses or their feed. However, most distress is usually short lived and by the next day the foal won’t be looking for the mother and will have adapted to the new surroundings. However, you should always make sure you do your homework on weaning. Although the separation is relatively painless it is important to learn the best way to wean a horse. There are several techniques that allow the foals to have less stress. In Middleburg, Virginia the researchers at Virginia Tech’s M.A.R.E. Center started a group method of weaning with groups of 12 mare and foal pairs. They removed a few of the mares from the group and then waited three or four days before removing some more. Eventually only one mare was left as a babysitter. The foals were anxious for a day but since they were with their pasture mates and in familiar surroundings they weren’t as stressed. Those who are abruptly separated may face more stress. 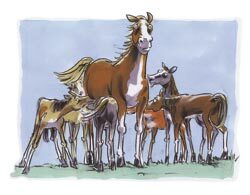 The gradual method of weaning is advocated by some which is the process where the foal goes to an adjacent corral for a time and each day the length of separation is increased. This way the mare and foal can still see each other, but they will spend more time apart and become more independent. While this process can sometimes take up to two weeks it also alleviates the most stress for the horses. The M.A.R.E. Center found that the method that doesn’t work is when the foal is put into a stall while the mare is taken away. There was much more stress since the foal was placed in an entirely new setting after being on pasture with the mare for twenty-four hours a day. However, if you have no other option but to do it this way you should make sure the mare and foal are in the stall together for several days before you start weaning. Virginia Tech and Rutgers did another research study which determined that an equally stressed foal won’t help the situation. Foal pairs who are both stressed when placed in a single box stall together have more stress than when they are weaned separately. Your facilities will play a large role in how you wean your horses. Without sufficient acreage the abrupt method won’t work well. Both mare and foal will remain stressed as long as they can hear each other. If you have only a few foals the gradual method is the best option. The foal should be receiving proper nutrition during the whole process. There have been studies that have shown that there is less weaning stress if the foals are used to eating grain concentrates. When the foal starts eating the mare’s grain you should start feeding them using a creep feeder to keep the mare out. Then by four months the milk from the mare will no longer meet the energy requirements of the foal. During the first three months you should feed one pound per day for each month of age. Then you should switch to feeding about 1.5 percent of the foal’s body weight until the weaning period. There are enormous advantages to creep feeding. Foals are larger and heavier as a result of the faster growth rates when compared to non-creep-fed foals. Creep fed foals are better able to cope with the stress of weaning and are less affected by the weight loss when they are taken away from the mare. This change in life will also give them less trouble if they are already accustomed to eating feed. When foals learn what the feed tub is about and haven’t been creep fed they will likely grow and put on weight rapidly, but this isn’t exactly positive. Developmental orthopedic disease or DOD can develop from the rapid growth. The risk can be lowered by creep feeding your foal. Thoroughly inspect the area where the foal is going to be during weaning and make sure your facilities are in order. There should be not loose boards or nails in the stalls. There should be safe fencing and high gates in the pastures. Whether foals are weaned in a stall or in the pasture you should remove halters. Halters can more easily get caught on objects since they foal is fretting over the new situation. This can result in serious injury or death. You shouldn’t deworm at this time. You should do it a week before weaning and then wait until three weeks after. Read the next horse care article on Weaning Healthy Foals.